Honohan is known for his strong views on the treatment by financial institutions of debtors in distress. THE PRESIDENT OF the High Court has issued a direction to remove debt cases from the Master of the High Court. 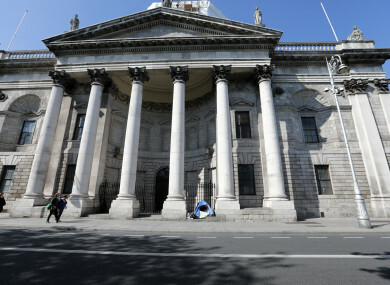 The direction signed by Mr Justice Peter Kelly yesterday states that motions for judgement in summary summons proceedings, the majority of which are debt cases, will no longer be set down for hearing before Edmund Honohan. Instead, they will go directly to a judge of the High Court. The direction does not state the reason for this decision. In recent years, Honohan has become known for his strong views on the treatment by financial institutions of debtors in distress. He has been particularly vocal in relation to possession cases and often engages in heated exchanges with barristers representing lenders. He has also written a bill sponsored by Fianna Fáil TD John McGuinness, the Affordable Housing and Fair Mortgage Bill. The bill includes a number of proposals for tackling the number of households struggling with mortgage arrears. He also recently wrote to Fianna Fáil leader Micheál Martin, reminding him that it is his job in opposition to call out the vulture funds that are buying up distressed home loans. Earlier this month Honohan defended breaking windows in a Four Courts courtroom as he said there were issues with ventilation. He described Honohan as “one of the few officials who have spoken the truth about banks’ behaviour and has tried to help those crippled with debt”. Email “High Court President directs debt cases be removed from Master's Court ”. Feedback on “High Court President directs debt cases be removed from Master's Court ”.